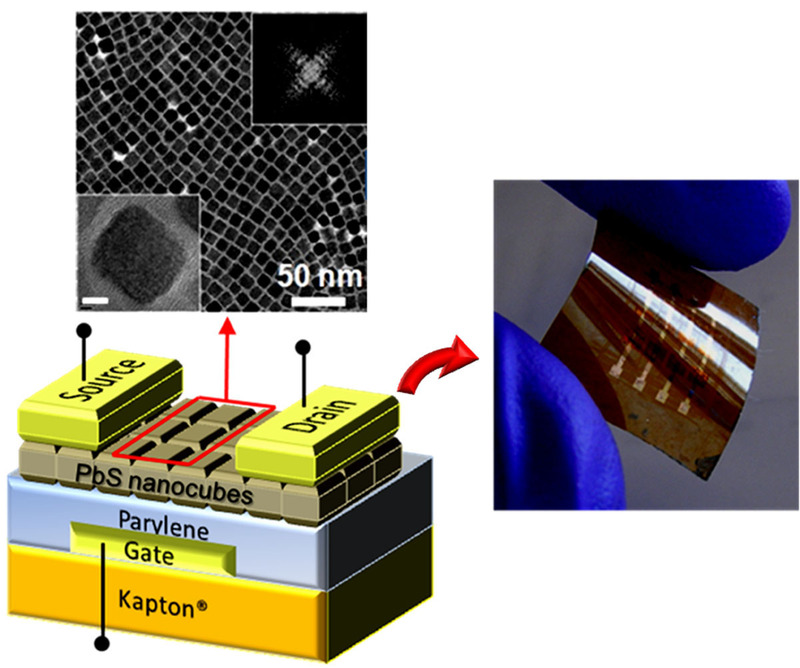 11 nanometer PbS nanocubes are form close-packed assemblies and integrated to form the active channels of thin film transistors that are ambipolar, transporting both electrons and holes. Exchange of the surface with a compact ligand allows facile charge transport and the fabrication of electronics and the first quantum dot circuits that are further integrated on flexible plastics. Kagan and Murray fabricated the first electronic circuits from nanometer scale semiconductor particles known as quantum dots. These quantum dots are synthesized in solution and tailored in the shape of cubes so when they are assembled into solids, they fill space. The nanoscale cubes allow for high performance thin film electronics. The chemistry developed further allowed these circuits to be realized on plastics for flexible electronic applications. W.-K. Koh , et al, Nano Letters 11, 4764–4767 (2011). Partial Support. J.-H. Choi, et al, submitted.